How can your society get involved in Misogyny Is Hate? You may have seen Misogyny Is Hate outside the SU on one of our Drive Days, or you may have come to one of our events such as our Pizza and Prosecco networking evening. The cause may have caught your interest and now you might be wondering… what can I do? If you are a member of a society, or even run your own, here are some of the ways you can get involved in Misogyny Is Hate. Our campaign events, in particular, are essential for both networking and raising awareness for the campaign. Your involvement, or even just your attendance, could dictate the final success of the Misogyny Is Hate campaign. On 15th November, we will be holding a ‘Blanket’ Night where we will be covering the streets of Manchester with Misogyny Is Hate posters. Here, we will need as many volunteers as we can find to get involved so that we are successful in covering Manchester from Fallowfield, through both UoM and MMU, to the city centre. Following this, we will be holding a demonstration in the city centre on the 28th November. This will involve a short performance art piece about misogyny. Your society may want to be involved in the performance or the direction of this piece. 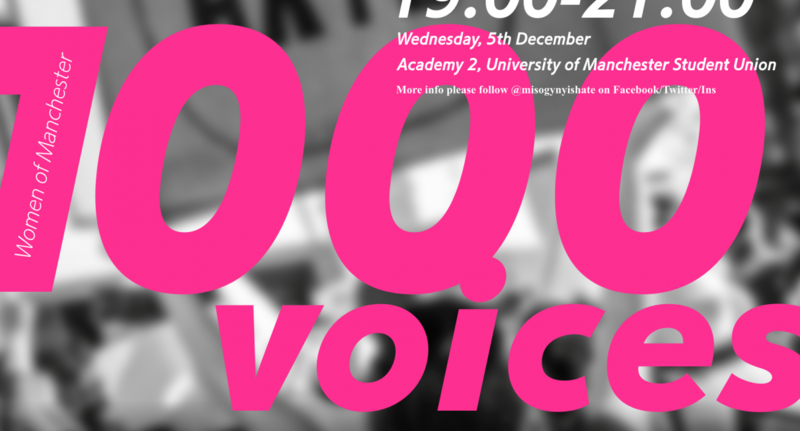 Finally, our ‘1000 Voices’ Rally on the 5th December. This is the most important event for our campaign and is where your help is most needed. This may be your opportunity to stand up and speak out for Misogyny Is Hate. In particular, performance-based societies might be interested in showcasing their work by performing at the rally. This may be anything from a music piece performed by a small singing group to a short spoken word piece. Alongside this, if you are passionate about making misogyny a hate crime in any capacity, and have something you want to say about the cause or anything related, then you may wish to be a speaker at the rally. The main purpose of the campaign is to fight the acts of crime that the women of Manchester are subjected to every day. We want to hear from you: what are your own experiences which make our campaign as important as it is? If you wish to share your own story you may want to speak at our rally or, alternatively, you may wish to write for us and have you work published on our blog (either anonymously or not). If you or your society want to get involved in our Misogyny Is Hate campaign, please contact us on our Facebook page, Instagram (@misogynyishate), or Twitter (@MisogynyIsHate). This post was a guest submission from the student-led Misogyny is hate campaign.